Trepanning is the process of cutting a hole into the skull. In ancient times this was done to let foul material flow out of the skull. This surgery has been done throughout history, often to relieve pressure and treat various mental illnesses. The X-files episode Orison featured a character who was trepanned and gained special powers. 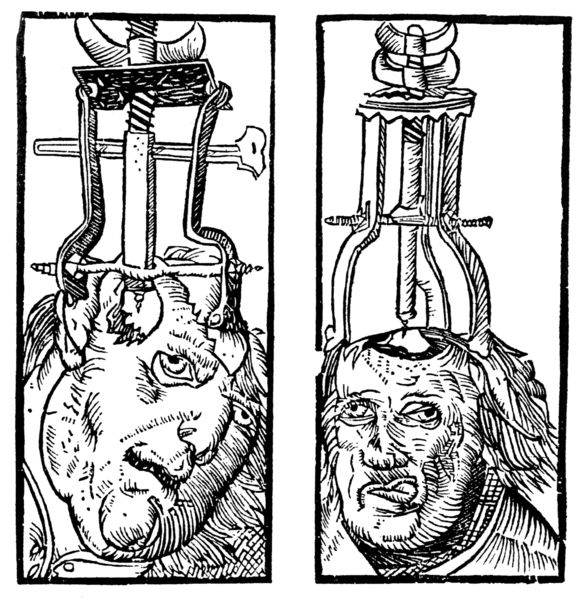 So why use trepanning in your game? Perhaps a player character has developed a mental illness or psychosis and this is the recommended treatment for his/her society. Perhaps trepanning is a rite of passage for a group of clerics or shamans, and the trepanning bestows special powers. Perhaps it is done against their will. I am sure that clever GMs will find a way to work this into any campaign. Roll a d12. (optional) +1 if the trepanning is done by someone with training. 12 - I can see the universe! Gain the ability to cast 1d4+1 cleric spells at will. Pick spells at random. 13 - I am Lord Azrael! Character becomes possessed by demon or celestial being. Grant powers and weaknesses from Manual of Monsters. Note: If psionic powers do not exist in the game world, then grant the ability to cast a cleric spell at will.